The arrangement we made originally was to stay at the home of Pedro and Olga for the first two days. 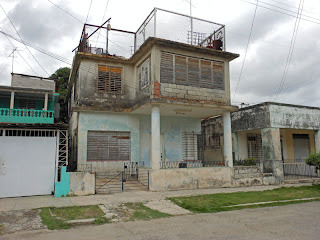 We did this because our visa application stated the reason for the trip was to visit family in La Habana. 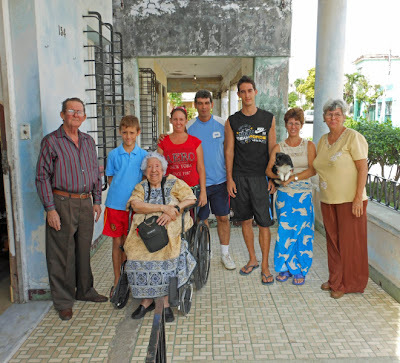 Once we made the application, the Cuban authorities actually went to the home of Pedro and Olga to verify that we were family and the exact nature of our relationship. We were not visiting as “tourists” because this is not permitted by the US government as a result of the US economic embargo. The Cubans refer to this as El Bloqueo (the blockade). 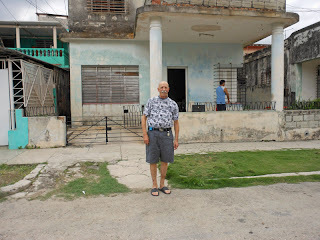 After two days, the plan was to move into one of the historic mansions in the oldest part of Habana (la Habana vieja) which have been converted into small hotels. 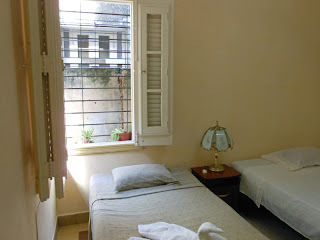 These small hotels have all the early 19th century colonial architecture and many with period furniture. They have been beautifully restored as has most of the historic district but the rest of the city’s infrastructure: buildings and streets, are literally crumbling. Let me tell you about our host family. 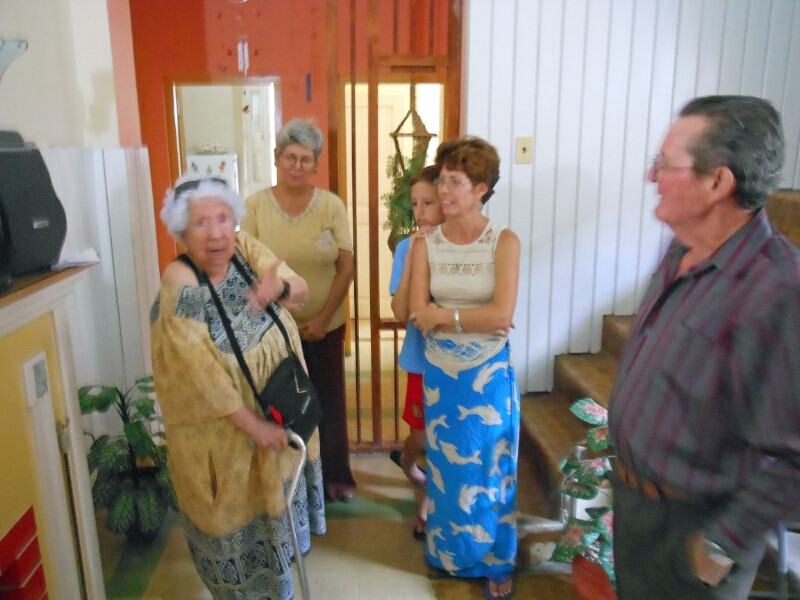 Olga is 67 years old and niece to Bertha’s deceased husband. Her husband of 42 year is Pedro, age 62 who was in the military for many years and now retired. Pedro is well respected (and feared) because of his connection to the military and government. Bertha takes comfort that we are “well protected” because of Pedro’s background and government connections. Living in the same house are two grand children, Daniel, age 19 and Pedro (junior) age 9, both are children of Maytee, age 38, our hosts’ daughter, and Jorge her spouse. Also nearby in the neighborhood is Niurka, 41 year old daughter who is twice divorced without children and now single living alone. 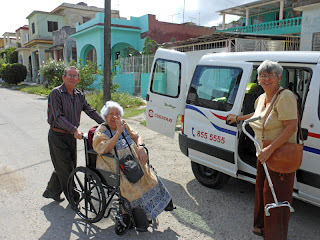 She works for the Cuban postal service. Bertha, Olga, Pedro Jr., Niurka, Pedro Sr.
Maytee, (the mother of the two children) has a doctorate in Optometry (obtained after six years of study – all education is provided free to every citizen) and is visiting for one month’s vacation from her assignment as a doctor in rural Venezuela. She took a two year government assignment in Venezuela in order to increase her salary to support her family. Maytee is the only person in this household who has a job. Jorge her spouse is a computer networking specialist. He is unemployed and was recently laid off after 12 years of employment with the same company. Daniel, the 19 year old is also unemployed after losing his job as a security guard at one of the tourist hotels. The unemployment rate in Cuba is at least 30%. Those who are employed by the government are paid in Pesos. For example, Niurka who works fulltime for the government postal service and the only one who has an e-mail address as a result of her government job earns 200 Pesos per month or the equivalent of 8.33 CUC’s or $7.16 in US dollars. Maytee, who chose to leave her family to go on assignment to Venezuela (in a dangerous rural community approximately 10 miles from the Columbian border – I’ll tell you later about the 60+ bodies found in the streets each and every week) so that she could raise her salary from 15 to 120 CUC’s monthly, or to $103.80 US dollars. She has to pay all her own housing and food expenses. She is the only source of regular income for this entire extended family. You have absolutely no idea what a blessing it is to live in the United States of America. This comparison is making every moment memorable. End of Part 1b, please see Part 2. George will continue his story as Brock Ba'jer's newest guest author: a Memorable Man.